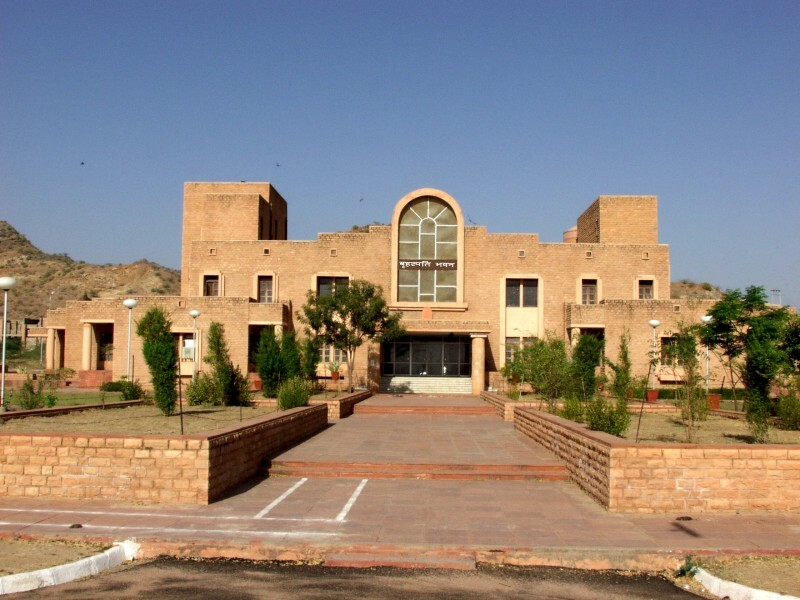 The Maharshi Dayanand Saraswati University, Ajmer is a comparatively young University of the country that came into existence on 1st August, 1987. Ever since its inception the University has for the last 25 years never settled for a slow pace – it has steadily and successfully marched on the road to development attaining several milestones during its journey of growth and progress. There has been an astonishing growth in the University infrastructure that includes magnificent buildings, hi-tech science laboratories, a state-of-the-art Computer Centre, a prestigious Library, an Administrative and Examination Block, a Science and a Management Block and a highly impressive Vice-Chancellor’s Secretariat. The teaching departments and centres of learning at the university campus include Botany, Commerce, Computer Science, Economics, Education, Environmental Science, Food Science and Nutrition, History, Journalism, Law, Library and Information Science, Management Studies, Microbiology, Political Science, Population Studies, Pure & Applied Chemistry, Remote Sensing and Geoinformatics, Sanskrit, Yogic Sciences and Human Consciousness, Zoology and Center for Entrepreneurship and Small Business Management (CESBM). There are 226 Government and Private Colleges affiliated to this University, which are spread over 4 districts of the state of Rajasthan. The Department is unique being the only one of its kind among all universities of the State of Rajasthan The Department of Remote Sensing and Geoinformatics opened under the School of Space Sciences and was introduced in the year 2001. The School of Space Sciences aims at meeting the needs of the society by providing advance training to students in geospatial domain through a structured curriculum with integrated multidisciplinary approach involving latest advances in the fields of remote sensing, GIS, photogrammetry etc. The students passed out with a post graduate degree from the institution are well placed in government and private sector across India and abroad. The Department credits to itself with many projects sanctioned by University Grants Commission, New Delhi, ISRO and Ministry of Environment and Forests, New Delhi. Department of Remote Sensing and Geoinformatics run a two year Integrated Masters Program and Doctoral Programs in Geoinformatics. Bachelor of Natural, Physical & Earth Sciences / Geography, Engineering or Master’s Degree in Natural, Phyiscal and Earth Science including geography with 55% marks at graduate/post graduate level. This Masters curriculum is a 4 semester programme where in one semester is completely based on dissertation and Project work on GIS and Remote Sensing. The Department is currently headed by Prof. Sarveshwar Palria with a team of inhouse teaching Faculty/Guest faculty. Besides the visiting faculty are from various other organisation like RRSC, Jodhpur, Space Applications Centre (ISRO), Ahmedabad, Birla Institute of Science and Technology, Jaipur, UPRSAC , Lucknow , OTS, Jaipur etc. The Department is well equipped with modern equipped with quality equipments required for teaching and research.TheGeomatics Lab is well equipped 40 NOS interactive computer terminals with multiple functions of teaching/ practical in Statistics, Geomatics (Remote sensing and GIS) and communication (animation) and general use for internet browsing, word processing, statistical analysis of data, etc. The Geomatics Facility includes most of the geospatial softwares such as ARC GIS, ERDAS, Geomatica, IGiS licenses and relevant instruments as required in the Geomatics domain Like A0 Size Plotter and Scanner and Trimble R3 DGPS and other GPS. The GIS lab has always instigated and encouraged students to take up research projects. In its endeavour, the lab carries out research work in the field of Biodiversity conservation and Management, Wetlands, National Parks, Climate Change, Urban Planning and Management, studies on Mining impacts and on an overall spatial domain. It is noteworthy that over 200 M.Sc. and 10 Ph.D. Students have completed their project at RS & GIS lab and numerous research and consultancy projects have also been completed. Many research projects are ongoing funded by Ministry of Environment and Forests, New Delhi, SAC/ISRO Ahmedabad.